**NOTE** the screenshots and some of the details on this tutorial are outdated. They were based on 3.1. The sACN output plugin underwent some significant changes for 3.2 and consequently some of the detailed steps and screenshots in this article are no longer accurate. The underlying concepts however are sound and this article will remain available until we are able to update it. If you only have a few strands that you would like to set up in Vixen, or want to get started quickly, setting up one strand per Universe will be the simplest way to achieve this. 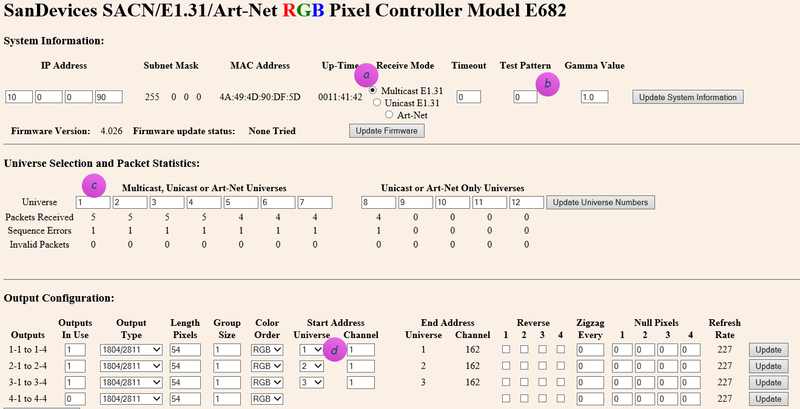 In this example I will set up 3 strands of 54 RGB pixels each, running over WS2811. 54 pixels  x  3 colors = 162 channels per strand. 162 channels x 3 strands = 486 channels overall. This example sets it up so that strand 1 is on Universe 1, strand 2 is on Universe 2 and strand 3 on Universe 3. NOTE: One Universe-per-strand is not a good layout to deal with large displays like Megatrees, and in fact it’s not possible to set up a E682 with 1 Universe per strand and still use all 16 outputs. However, it’s a good way to learn initially, and fine for small displays. Caveat: This assumes you have nothing else set up. If you do – you will have to change your numbering accordingly. Set the page up as above. 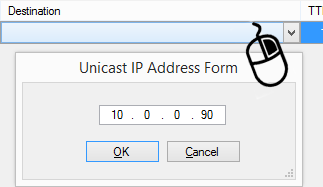 a) Make sure you’ve specified Multicast, and no test pattern (b). If you change either of those, click “Update System Information” before proceeding. TIP: After you change any one line on the page, you have to first click the button on the right of the line to apply. Don’t fill it all out and then click one of the buttons, you’ll lose all of your other changes! 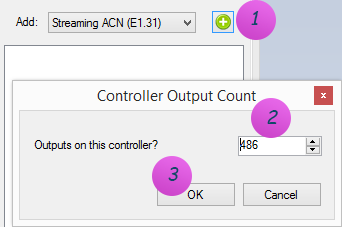 b) To connect the SanDevices controller, in Vixen 3, click on Setup Display and add a new Streaming ACN (E1.31) controller. 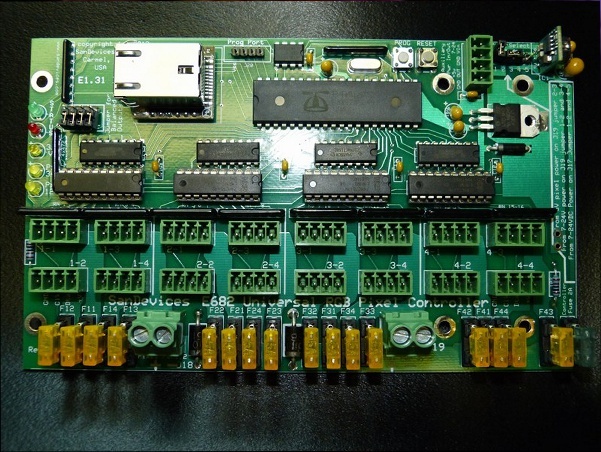 Specify 486 outputs in order to match the 486 channels (53 pixels x 3 colors x 3 strands). NOTE 1: The name ‘Multicast Ethernet’ may be called something else. This is the default name on Windows 8. On earlier operating systems it may be called: “Multicast Local Area Connection”. NOTE 2: Remember to check the ‘Act’ setting (for Active), otherwise nothing will show. NOTE 3: The ‘Start’ column above is the Vixen 3 start address of the channel inside its logical E1.31 controller view, and only comes into play if you need to individually map pixels to specific channels. It has nothing to do with the SanDevices controller, and likely will not map to any number you will see on the SanDevices configuration page. d) Now create 3 elements to map to the 3 strings. These are the items that appear in the Sequence editor that you will use later to choreograph against. 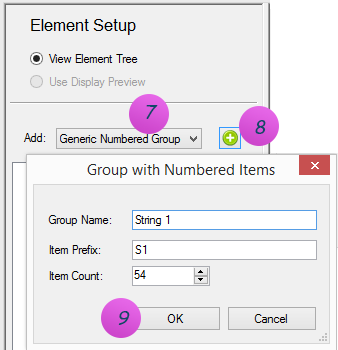 On the left hand side, add a ‘Generic Numbered group’ for String 1. Repeat the same steps for String 2 (item prefix: S2), and String 3 (item prefix: S3). e) After this you should see 3 strings. Select them all. f) Notice above how it says: 162 patch points. At this point Vixen thinks you want 1 channel per item on the string. This is not quite right yet – you instead want 3 channels per item (RGB). So we need to tell that to Vixen. 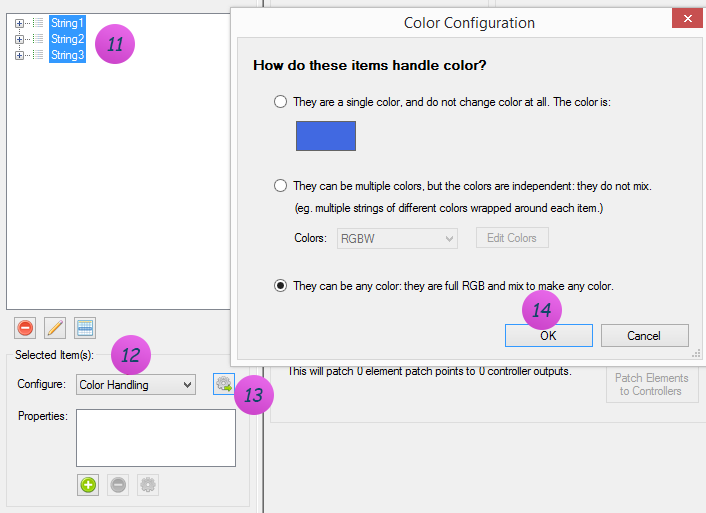 At the bottom on Configure, select ‘Color Handling’, and add the RGB filter. h) Click “Patch Elements to Controllers”, and you’re off to the races!